As swampy, sticky, itchy June heat and deep summer settle in, it's almost pleasant to think about the blue toes and frosty mornings of that late season coyote hunt that upped my respect for the sneaky bastards to the crisis point. We got the call to arms from Mark Sidelinger, a marketing mastermind for a broad range of outdoor toy-makers. 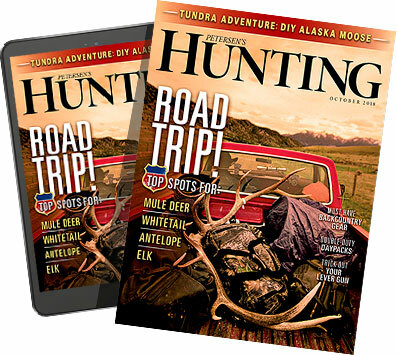 The pitch: A total of 10,000 acres of leased whitetail land that is among the world's best (west-central Illinois) was overrun with howling furry fawn killers that were seriously impacting the whitetail herd, and he wanted a crack crew of hunter-killer hunt mag editors (he corralled two of those, plus me, the hard luck hunter-editor hike-a-lot guy) to descend upon the place and start ventilating coyotes with the latest trick calls and Rock River Arms ARs. Ha! The dirty dogs didn't have a chance! It was late winter, they'd be starving and ha-ha-ha, it just snowed a foot, so we would be able to see them as though they were painted white in the forest. We were stoked. Die, fawn killers! Illinois, a coyote-hunting destination? Who knew! I asked for a prediction of success from our IMO predator magazine editor at the time: "Skip, it should be good with the snow, but&apos;¦not to bring you down (which means "I'm about to bring you down")&apos;¦10,000 acres sounds like a lot but really is not&apos;¦and you're gonna be there three days? I predict you will cover and call that whole place in the first day, kill a few, and it'll be tough after that." I figured as much. But one day of good action sounded great. Then we could try some cool night hunting or something, perfectly legal here and most places. I pointed the FJ southwest from Peoria through the frozen cornfields along the wide, ice-covered Illinois River to the pretty hardwood patches and classic corn and soybean whitetail country down towards the Missouri border. Talk about country that is just one giant feed plot. A vagrant could live in the woods here and grow to record book proportions on corn, acorns, and beans&apos;¦and the morels these mid-westerners freak out over in spring. As I searched out the big white farmhouse we were bunking in, a young coyote dashed across the road in front of me. It was about as close as I'd come to killing a coyote in the next three days. A nice break in the weather that made the sub-freezing temperatures pleasant and the woods quiet put a thick crust on the snow that announced our every move, and despite daily death-hikes and sneaky call setups with Foxpro's cutting edge calls, we pulled in no hungry dogs. We'd hear them howl and pack up some evenings getting ready to hunt for the night, and it was maddening. Jeff Johnston and I were frustrated and bloodthirsty enough to head out under the full moon and try some laser light call setups with Scott Catton of Dynamic Finishes. Sneaking around in the moonlight and hunting varmints with state of the art Rock River varmint rifles all camo-ed out in white frilly ghille suits and gear is about as much fun as grown up boys can have, but the coyotes were unimpressed. The nocturnal assault rewarded us with a fleeting glimpse of a bear-sized boar raccoon, and collective rear-ends cold enough they didn't thaw for two days&apos;¦about the time my head cold from the whole ordeal really settled in. Hunting camp is never a waste, though. New friends were made and the BS sessions with Brady Arview, head of sales and marketing for New Archery Products, were all-time. He brought riveting cool slow-motion video footage of his latest broadheads and arrow fletching kits in action. 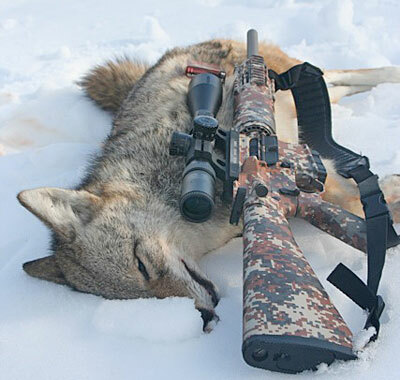 Jeff sniped a random coyote on the last morning on a different farm at a long distance, but it was never fooled by a call. As a displaced Westerner, my fantasy about eastern coyotes being big, dumb and underhunted was cruelly shattered, though.